Good morning!! I certainly hope is a beautiful day where you are. It's looking pretty promising here!! Well, I didn't get these photos uploaded in the order I'd planned, and it's too late to go back and change it now, so you get to see the close up first. This card came to life for the weekly Peachy Keen Challenge. This week our challenge is to use faces on our project or card. I just got the adorable "Faceless Fruit" set from Kathy, along with a set of Assorted Basic Paper Doll Faces. Oh my goodness!! The possibilities with these sets are endless!! It just makes one's head spin!! 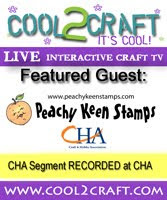 :-) Be sure to check the Peachy Keen Challenge Blog for all the amazing samples from Viv, Diane, Sonia, and Kathy. They will WOW you with their talent!! The sentiment for this card is computer generated. I was struggling a bit with this challenge, trying to decide between doing a paper doll, and using the fruit stamps, which I was anxious to do, and then the idea for this card came to me in my sleep. I'm always surprised at how often that happens, but it probably explains why sleep eludes me so much of the time. In this case it was a good thing. Now, wouldn't you like to be the winner of THAT gift certificate? Come on! It's easy to add your submission with Mr. Linky, and we'd love to see your take on this challenge! For the layout on this card, I used the Sunday Sketch and Stamp Challenge. There are so many challenges out there that we should never be at a loss for where to begin! I love to play along with this one whenever I have the chance. Thanks for sharing part of your day with me! I'm always thrilled to have you join me! May you have a blessed and glorious day. Lorie, those are the yummiest watermelon slices I have ever seen! You colored them just beautifully. I better get a move on for my card this week, so I get a chance to win some big bucks! i posted the challenge on my blog. Another gorgeous Lorie card!! Love these little watermelons and the colors are beautiful! Hi Lorie! Is it wrong for me to say that I want to eat this card? LOL. Ummm, I mean that I totally want to go to the store and buy some juicy watermelon now. This card is adorable and your coloring is so lifelike I can smell the watermelon through my screen! :) Another Fab card! There's colouring and there's colouring.....Lorie.. this is one FABULOUS card. The colouring is stunning. The melon looks WET! I'm in awe! Oh Lorie this is just soooo super sweet! I love those little doll faces on the watermelons. Your coloring is absolutely perfection. This is such a HAPPY card! It definitely made me smile. Thanks for sharing your cards and your self with us. A more beautiful person than you I don't think I've met! This is super cute, Lorie, and you're coloring/shading are fantastic! I don't think I could use these cute watermelons without having to use my "Bite me." stamp! LOL! Lorie, I love these happy watermelons! Your coloring is fantastic! Thanks for including our sketch from Sunday Sketch and Stamp. It looks great on this card! Love the saying! Your coloring is right on the money!